Manchester International School offers IB Primary Years Program ( PYP ) from Kindergarten to Grade 5, Cambridge Secondary Program for Grades 6-8, Cambridge IGCSE for 9th and 10th and Cambridge Advanced AS & A Levels for Grades 11th and 12th. 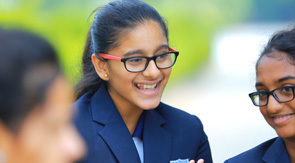 Manchester International School also offers national curriculum ( CBSE ) in a seperate block. Our curriculum has learning goals and subject standards as benchmarks that define what students need to know and can do as a result of theoretical and practical learning. These learning goals represent the best examples of standards and benchmarks recognized internationally as well as in India. Our Middle and Senior school program prepares students to take admissions in recognized universities worldwide. The curriculum focuses on international perspectives of learning and teaching, while maintaining a focus on students’ home culture and language. The core components of our curriculum encourage students to participate in creative and service-oriented activities, while emphasizing the importance of reflection on a personal and academic level. Senior school students at Manchester International School are advised to take exams of subjects that are academically challenging and meet the admission requirements of universities in the country in which they intend to study. We also offer Cambridge ICE Diploma in the High School. These examinations give students the opportunity to study individual subjects in depth. Students are challenged to work hard and teachers ensure that academic rigour is maintained at all times. Our curriculum is self-motivated, progressive and inquiry driven. Teachers and coordinators observe and update the curriculum as per the curriculum review cycle. Teaching methodologies and class content are planned collaboratively on a regular basis using a reflective process to improve the learning experience of all students.